Babblings of a Mommy: Sunscreen Meets Fun With Sunbow! Sunscreen Meets Fun With Sunbow! Summer-time is always exciting for the kids but it can be nerve-wrecking for parents. A little fun in the sun is good and dandy--but too much can be unsafe. Even more so when our little ones forget to put on their sunscreen! Parents can now find comfort with new Sunbow Sunscreen which offers all natural products specifically formulated for children's gentle skin but with their favorite animated characters like Dora the Explorer, her cousin Diego and SpongeBob SquarePants! To get kids even more excited about the application process this sunscreen is colored. 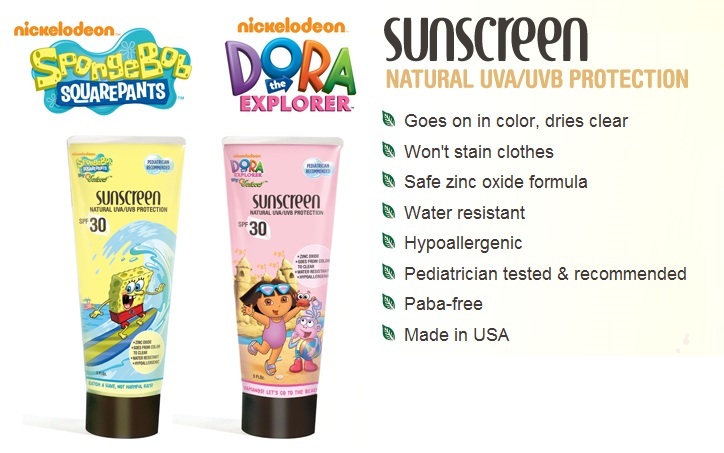 The Dora formula is light pink, the Diego is blue, and SpongeBob is yellow. This helps kids and parents alike not miss a spot. Don't worry, you won't have yellow kids running everywhere--even though the sunscreen goes on with color, it dries clear. This sunscreen gets two thumbs up from me. Not only was my daughter super excited to put on sunscreen (yes, sunscreen) but it stood up to the Florida Sun which you all know is no easy task.